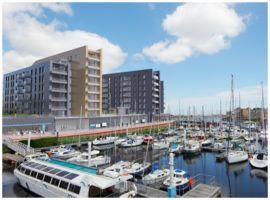 The Marine & Property Group are the parent company to five subsidiaries, each corresponding to their marinas and facilities in Cardiff, Swansea, Burry Port, Aberystwyth, and Port Dinorwic. They offer a range of services from berthing to maintenance and repairs, as well as property for marine leisure and commercial customers. 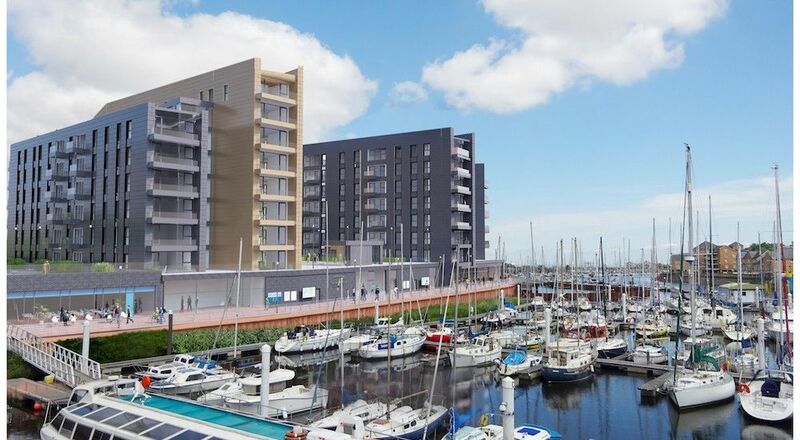 On the horizon is a lively new apartment and amenities development adjacent to Cardiff Marina called Bayscape; the money will go towards these new facilities. At the Marine & Property Group, we hold a range of stunning and practical marinas across Wales, where we offer quality berthing, drystack facilities, and beyond as we branch out into commercial properties. With over 1,000 berths in total, we endeavour to keep our facilities at the forefront of the latest technology available to boat owners. But we don't stop there! Our marine engineers travel widely to repair and maintain boats across Wales, south west England, and further afield. In fact, we have a subsidiary dedicated to this, Cardiff Marine Services, for whom we've raised twice before with Crowd2Fund. We're a large presence in the community and use this as a platform to promote good causes. We've partnered with the charity, CLIC Sargent, who support young people affected by cancer, to organise and attend events such as pub quiz nights, boat festivals, and marathons. In addition, we support The Green Blue initiative of the British Marine Federation and the Royal Yachting Association. Therefore, we do our utmost to consider the environment as we install solar panels and recycling bins, as well as regulating customer behaviour with regards to wildlife, sewage, and spillages. Our HQ is our Cardiff site. Adjacent to this, is Bayscape, a new multi-functional development on an exclusive waterfront setting. Primarily, this will include 1, 2, and 3 bedroom apartments for homemakers, thereby creating Cardiff's first and only marina address. We will use the money raised in this campaign to continue to develop these facilities, including a new management suite. Finally, we have a location for a coffee shop/lounge bar overlooking the River Ely and perfect for al fresco entertaining. Q. Great. Thanks. How much is the outfitting costing in total? A. Total target price with contractors Dri-Build is £338'233. This is the first of two projects (and Crowd2Fund tranches) we plan on delivering this quarter. Q. Seems this will provide soft facilities for the marina. How is previous parking, dry docking, maintenance covered? Q. Thanks for the prompt answers. Is there a plan to make CMGP, CDS, Aber, PD independently profitable without amortisation, depreciation, exceptionals? Or, why not? Aberstwyth (KPI-occupancy). With the completion of significant capital expenditure (£650'000) now completed occupancy is increasing by 15% per year. It is now making a net profit. Port Dinorwic (KPI occupancy and service productivity). Is highly profitable. 2017 accounts are for 5 months only and include exceptional acquisition costs. CDS / CMGP - (KPI Productivity) - is now just moving into profit after a difficult 24 months. New manager has secured major new contracts and new engineers. Q. The previous posted question, K (thounsand) should be M (Million). But the question still stands. A. Hello. The group consolidated balance sheet can be found here: http://themarinegroup.co.uk/app/uploads/2018/07/Consolidated-Accounts-Dec-2017.pdf It should all add up. Q. agree with others that the pitch write up says funds to continue fitting over 100 apartments as well as shower block & management suite so not only commercial.It may not be a problem but is confusing where funds are going if as you say flats are complete? A. Okay. I will ask Crowd2Fund to amend the description. Q. Your 2017 Balance Sheet does not add up? If your net equity is £19K, is your Current Liabilities really £25.7K? Q. You say "We will use the money raised in this campaign to continue to fit these apartments (over 100 in total)" but elsewhere you say the money is for fitting out the commercial spaces? A. Hello. We are not fitting out any apartments with the money raised. The apartments are fully complete (and look great...see photos of the show apartment here by way of example: https://www.bayscape.co.uk/gallery/#show ). These monies will be used for the commercial spaces and amenities only. A. This loan is unconnected with previous raises. Monies from previous raises has been fully invested to support business acquistions. All Investments are modelled to ensure that 1/ They make a net contribution to the group 2/ They do not erode the group EBITDA ratio to debt and 3/ They support an increment in the group balance sheet. Previous Investments are running and returning results per business plan. This new investment meets our modelled investment criteria. Q. Please clarify youir business involvement in Bayscape. You seem to imply you are the developer, but surely not? A. The main build has been completed by our sister company Bayscape Ltd. Bayscape Ltd has common shareholders to The Marine & Property Group Ltd. We are also the directors of Bayscape Ltd. The building has just been completed and the commercial spaces have been purchased by The Marine & Property Group Ltd for £875'000. The crowd2Fund facility will asist in funding the "shop" fit out works of the commercial spaces. A. Approximately £7m in The Marine & Property Group against a formally valued asset base of £24m. Q. Has any of the structure gone up - what stage is the development in? Q. Are there just two outstanding charges, and what are they for? A. Lloyds Bank and Ratesetter. The business is financed on a strict ratio of debt to equity of 40% LTV or less. See consoldiated statements for details. Q. I see many of the apartment are sold or reserved. That presumably only covers part of the build. How much do you rely on incoming profit and have you got liquidity currently? A. The Bayscape Phase I scheme has now been completed by our sister company Bayscape Ltd (common shareholders but a seperate entity). The Marine Group has purchased the commercial spaces from Bayscape Ltd for £875'000 per valuation on an arm's length basis. The requested funds from Crowd2Fund are for the purpose of fitting out the commercial spaces which are now owned by The Marine Group. As for the main build this is fully funded and the last contractor payment has now been made. Q. Hi Chris, Drew, would you mind giving T/O, OP and NP for each of the group companies?